This contemplative, dreamy book takes the sweet, sordid melancholy of a woman’s last days with her father, and grazes it with moonlight. The unnamed narrator retreated to her childhood home some years before the story begins, making her the obvious choice among her siblings to take her father in when a wretched cancer (in there any other kind?) renders him unable to live alone. Together they engage in a kind of waiting game, finding reassurance and solace in each other’s company. But as her sister Penny and her brothers come home to say their goodbyes, it grows increasingly clear that each comes bearing their own wounds. Not one of them seems entirely mentally well – Penny has her glow, but a dread of anything uneasy, in the most literal sense. Bold older brother Paul has done well for himself, between alarmingly frequent stints of bankruptcy, and the youngest two, twins Davey and Simon, battle schizophrenia and drug addiction respectively. As for our protagonist, well, she ‘drifts’, struggling to stay in the present, often haunted by a glimpse seen from her bedroom window as child.Like all the best writers of magic realism, Pinborough drops these scenes in with a weight that makes them feel at least as everyday as the moments shared with her siblings, eating bacon sandwich and endless quantities of chocolate biscuits. And for the duration of this book, this is all there is, and nothing else is needed. It’s a huge achievement to encapsulate so much in so few words – just 131 pages. Pinborough resists the urge to draw more spectacle into a story that in its quietness reveals the entire scope of human drama – life, death, love (in all its forms) and betrayal. These huge, sweeping ideas could quite easily generate chapter upon chapter of meandering explorations. By restraining hers to so few, Pinborough condenses their power to a degree that’s at once heartbreakingly personal and universally identifiable. And while this is an at times troublingly intimate view of the last moments in a man’s existence, it is a reminder that we are far more than the sum of our parts – we are each encounter, and therefore each memory, that we form part of. And that’s much more than one life and one death could ever be. 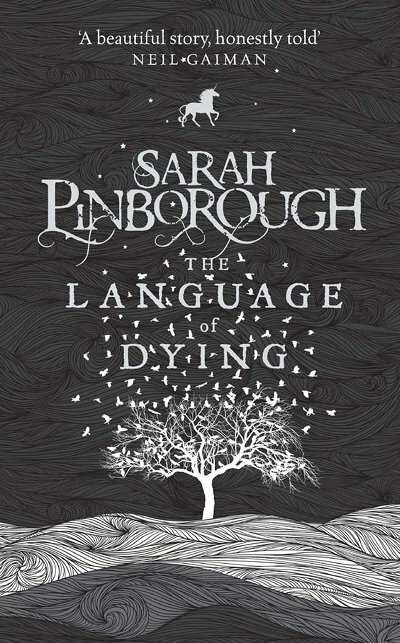 The Language of Dying by Sarah Pinborough is published by Jo Fletcher Books and is available to buy from Amazon. This entry was posted in Reviews and tagged Book reviews, Sarah Pinborough, The Language of Dying by Judy. Bookmark the permalink.